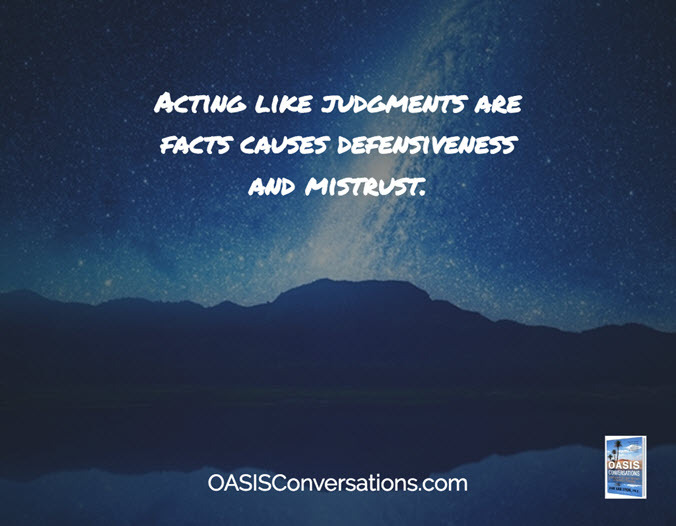 When you start a conversation with assumptions and judgments and act like they are facts, it causes defensiveness. If my family member had said, “You were rude and ruined my evening” without sharing his observable data first, I could have been defensive. I might have verbally attacked him for not being clear about his expectations or for his unjustified outburst. In the workplace, if I observed that Marla, a staff member, did not volunteer to join a project committee, I might assume that she was not committed to the team. Marla might become defensive if I stated that. Then, she probably would be focused on protecting herself rather than being open to solving my concern and coming to an agreement. However, if I start the conversation in a non-judgmental tone by saying, “I notice that you did not volunteer to join the committee,” Marla might offer that she is working on some other aspects of the project or give other evidence of her commitment. By acting as if my assumption that “Marla is not committed” is a fact, I can easily gather support for my flawed viewpoint. Here’s how: If I do not explore my perception and continue with my assumption that she is not committed, I will behave in ways that convey that perspective. Perhaps I will not inform Marla about other related meetings or information critical to the project’s success. Since I assume Marla is not committed, I then act as if she is not. She may pick up on this attitude and decide to put her effort elsewhere. Then my assumption has become a self-fulfilling prophecy! When we have a misunderstanding with another person, it can lead to mistrust. For example, my colleague, Kathleen, and I agreed that we would have dinner at Tiparo’s Thai restaurant down the street from our conference hotel. When I received a call from her on my cell phone as we were each going to our rooms, I said, “Okay, I’ll meet you at 6: 00.” We had been meeting after our conference for the last few days in the hotel lobby. That evening when I waited in the lobby for her, Kathleen did not arrive. As I reflected on our confirming conversation, I realized we did not specify where we would meet. In fact, Kathleen was waiting for me at the restaurant! What seemed obvious to me— that we would meet in the lobby— was not to her. After I called her, I learned that she had assumed I might get delayed with another meeting. She had thought it best to go to the restaurant to be sure to get us a table. Oops! By understanding what another person is observing and responding to, you are more likely to grasp his or her concern or issue. If a colleague tells me she is not satisfied with a report I submitted, I can only guess why. Was she expecting it to be longer, in a different style of writing, or to have additional items included or excluded? Was she concerned about minor typographical errors? Often, conversations occur where each person involved believes he or she knows what the other is talking about. Sometimes, it is not until later that you find out otherwise. Sometimes, you never find out!